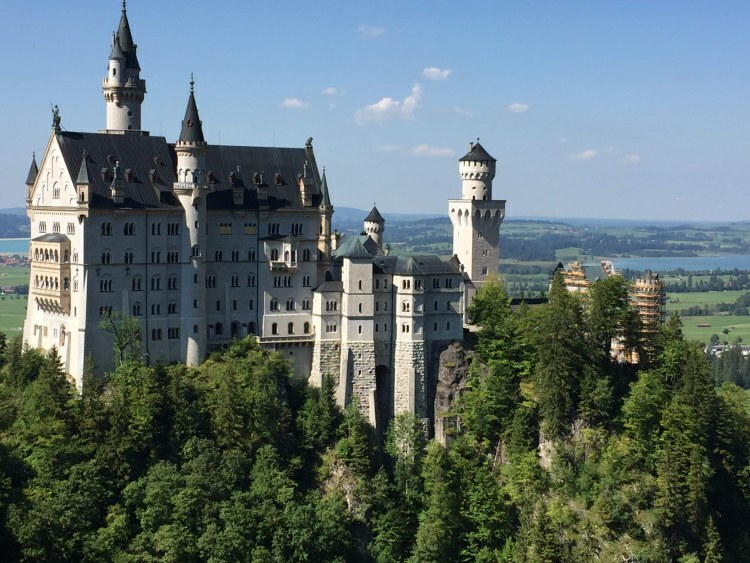 Neuschwanstein Castle is often called Cinderella’s Castle. 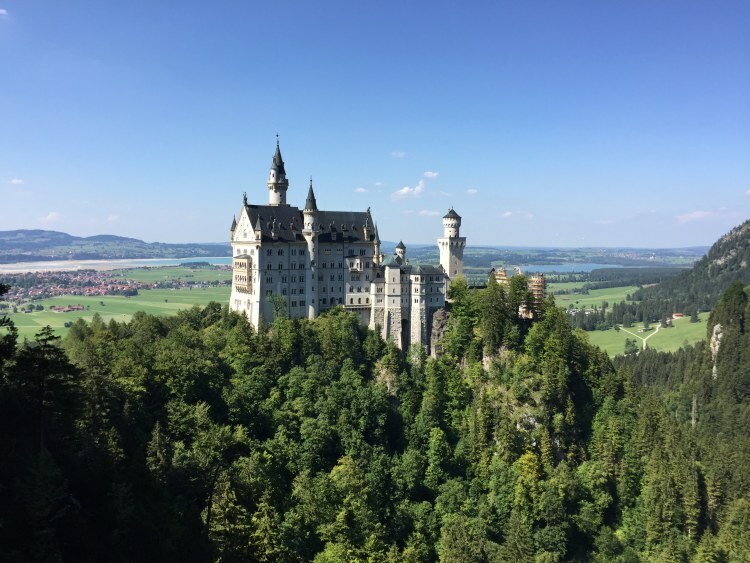 Neuschwanstein is surely one of the most beautiful castles I’ve seen, however we had to fight the crowds to get these stunning views. 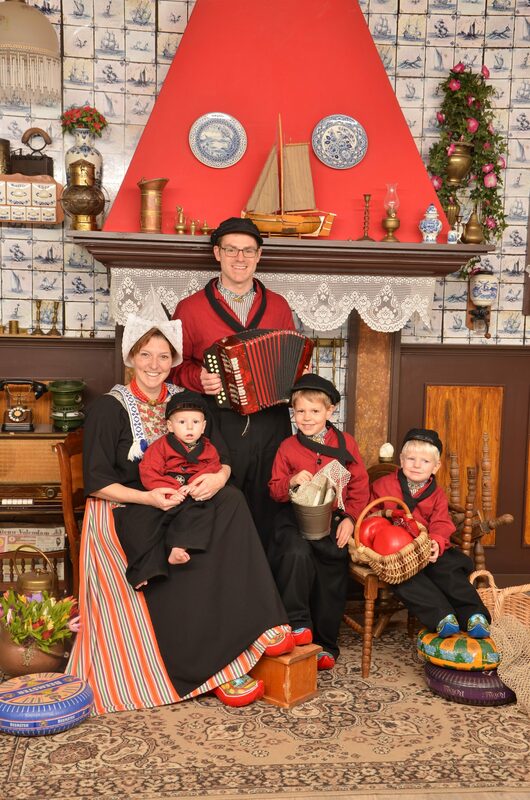 Our summer visit was ill timed, but the only time we were going to be in the area. 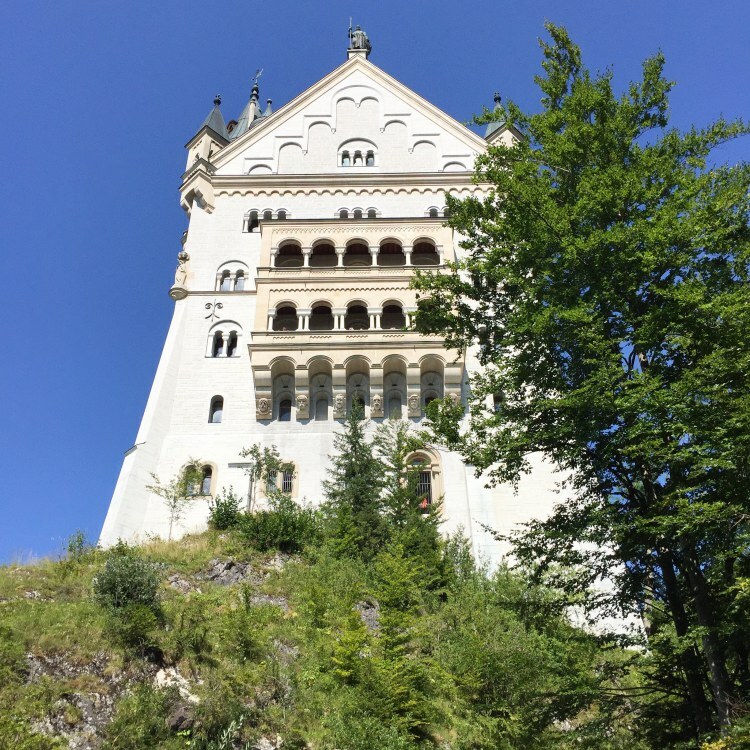 We opted for a quick pop in to see Neuschwanstein from a distance and then hurried away from the crowded tourist city. 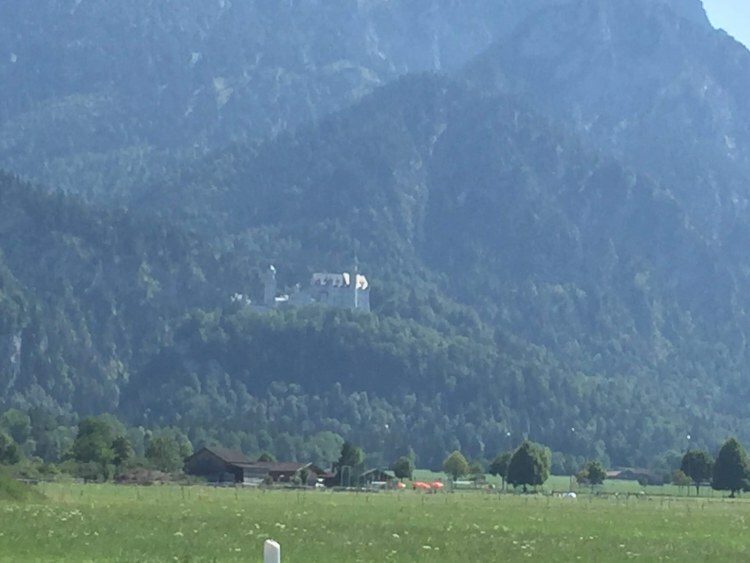 Neuschwanstein Castle is easily viewed from nearly anywhere in the surrounding valley. We began to see it just before we hit the traffic headed to the city at its base. In Medieval times three castles overlooked this valley, although by the 1800’s all three had fallen into ruin. 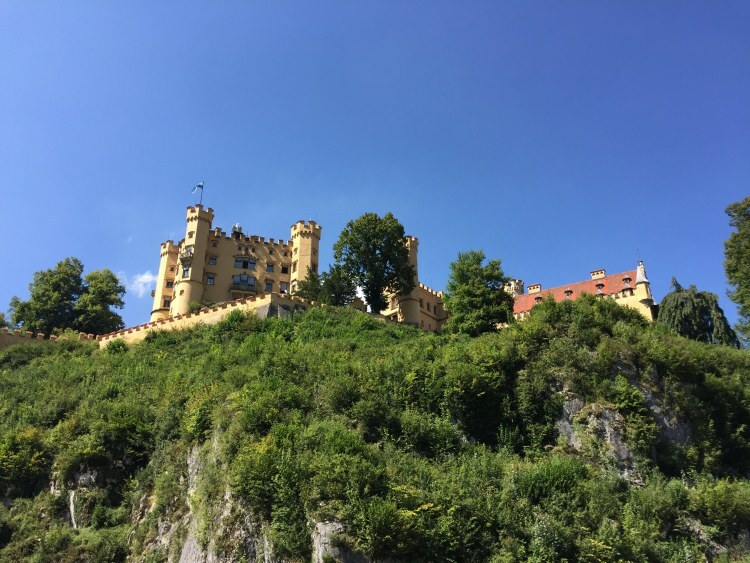 The ruins of Schwanstein Castle were purchased by King Maximilion II of Bavaria and replaced with a comfortable palace known as Hohenschwangau. 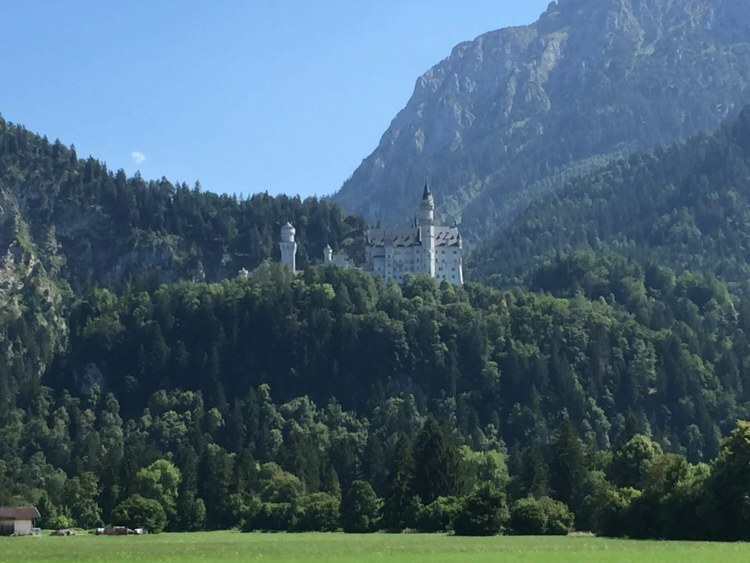 King Maximilion’s son, Ludwig, would later build Neuschwanstein Castle on a second set of ruins further up the mountain. 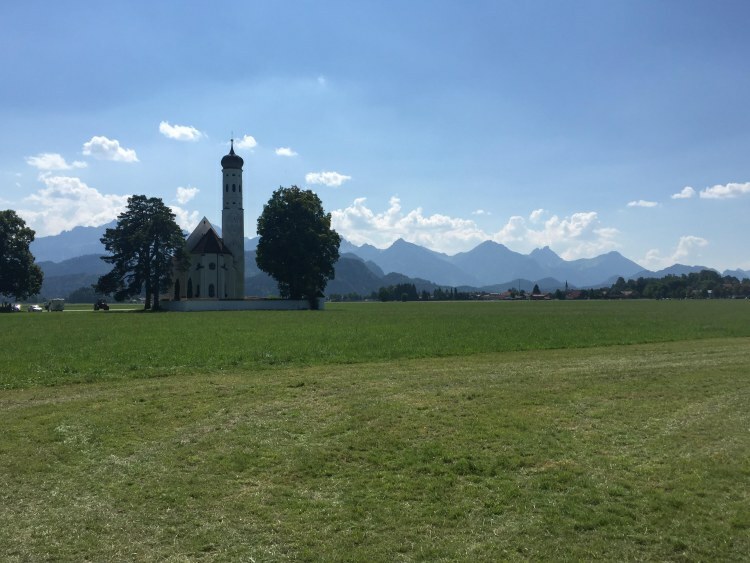 Our favorite distance view of Neuschwanstein Castle was from the pull off near this church. (I wish that I could give you more details, but I’m not even sure what road we were on.) It is the only church in the field as you head toward the castle. The church and the castle are both incredibly picturesque. I was already annoyed at the crowds, but the views kept coaxing me in. The town was crazy busy. 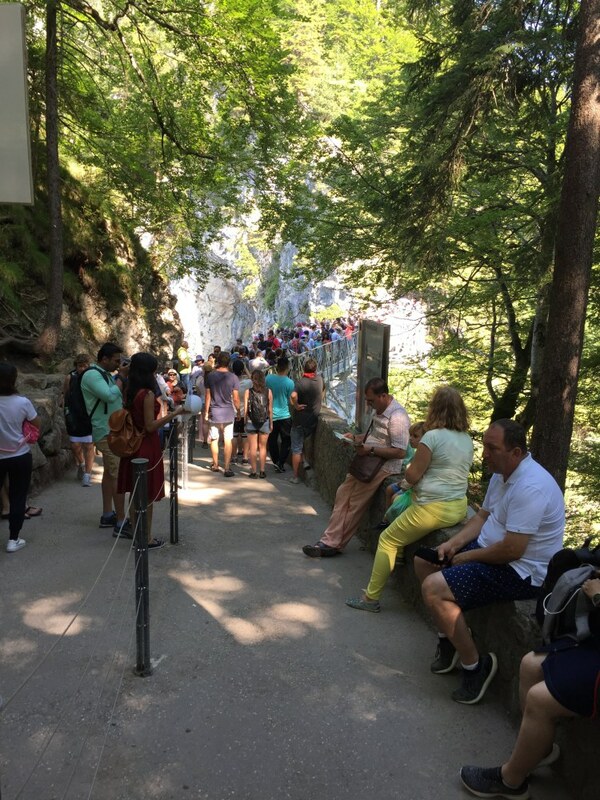 We arrived in the early afternoon and were able to find parking in the paid lot under Hohenschwangau castle. We opted not to take any of the castle tours. The tours often book up and reservations cannot be made in advance. We have also toured a lot of castles in Europe and Jeff had previously toured solo. 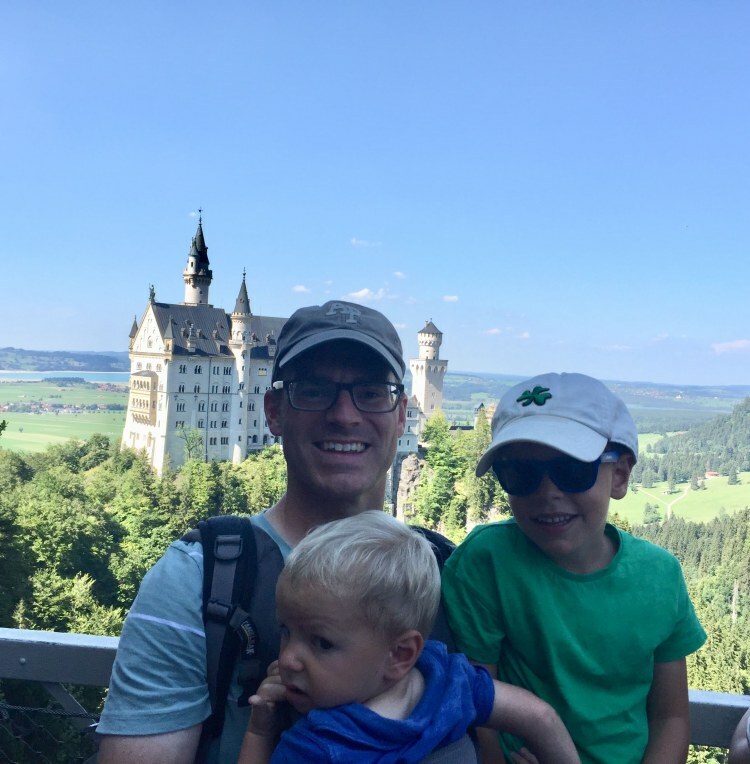 Instead we opted to take in the outdoor views of this stunning castle. My parents were with us so we opted to take the bus up the mountain to St. Mary’s Bridge which is known for its incredible views of the castle. The views are, in fact, the best available. The bus driver mentioned that we were lucky to be there during a less packed time of the day. The bridge was completely packed. I’m not normally nervous about the kids, but people were so crazy out on the bridge we had the kids sort of shifted away from us several times. There are selfie sticks everywhere. It is not a pleasant situation. Jeff was able to get someone to snap a quick picture, but due to the volume of traffic on the bridge there is really no room to get a nicely framed one, although you won’t lack for people to ask to take your photo. It does just have the most picturesque views though. If there is any possible way to visit here off season or to arrive very early I highly recommend it. From the bridge, my parents hopped the shuttle back down while we opted to walk from the bridge to the castle’s base. This walk is easy, but steep in a few places. It provides beautiful views of the castle and of the surrounding woods. We loved the changing face of the castle as we worked our way around it. The plaza where the ticket desk for tours is located is still a bit beneath the castle. Here you will find people milling around waiting for their tours to start. It’s not uncommon to arrive in the morning and only have afternoon tours available. 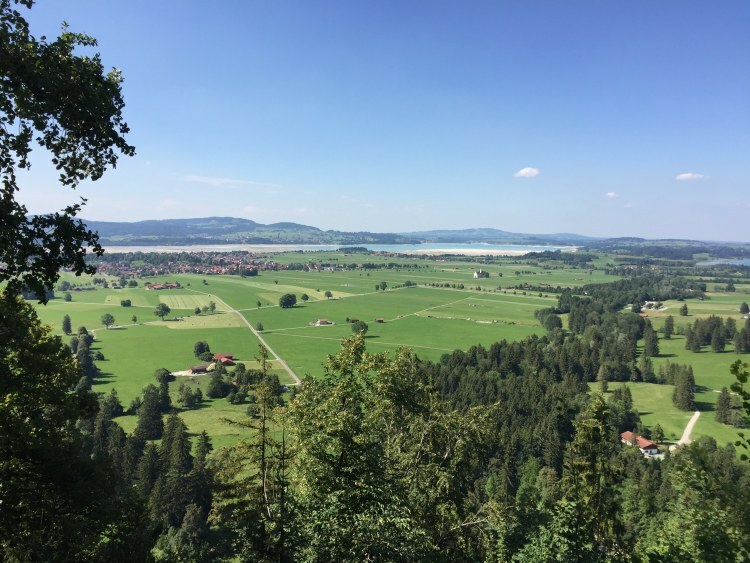 Since we were skipping the tours we took advantage of the platform to enjoy the sweeping views over the valley. 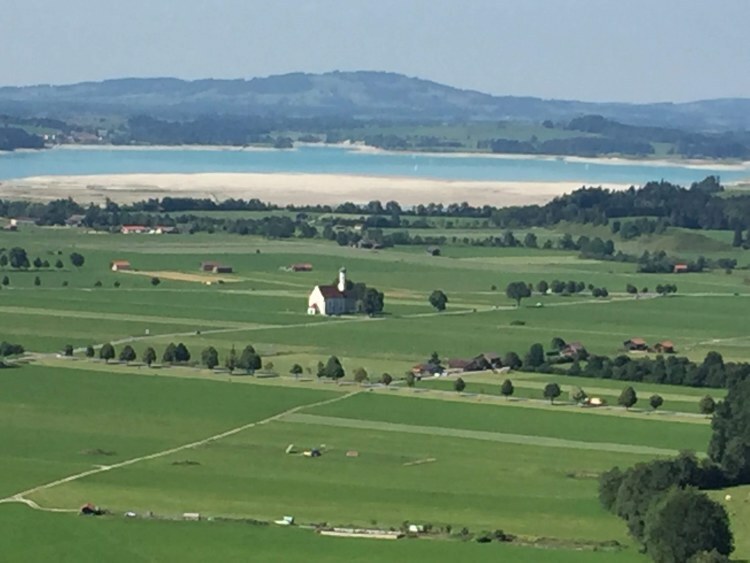 The views were so clear and crisp I was even able to pick out the church we had stopped in front of to take the photo. Then we started the hike down. You can either walk down via the road or a path that serpentines through the woods. We opted for the steep path through the woods and soon found ourselves alone. The woods were quiet until the path rejoined the road near the parking lot. 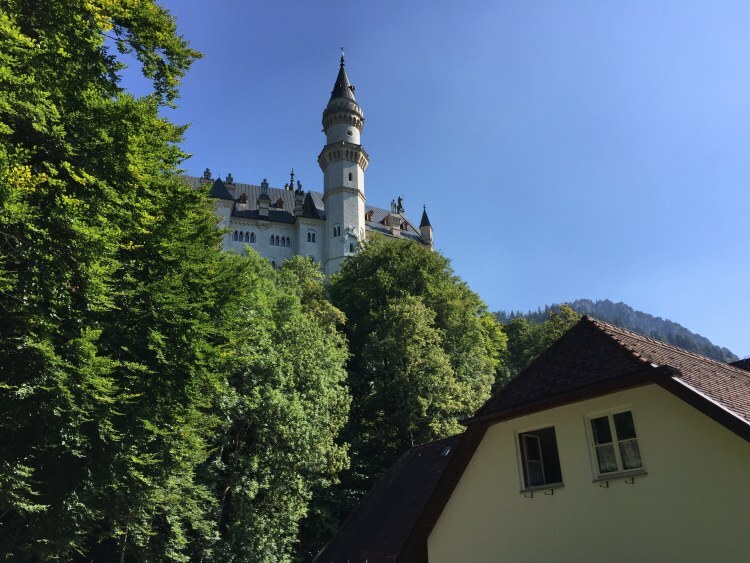 We really loved the look of Neuschwanstein, but could do without the crowds. There are some great hiking paths in the area. 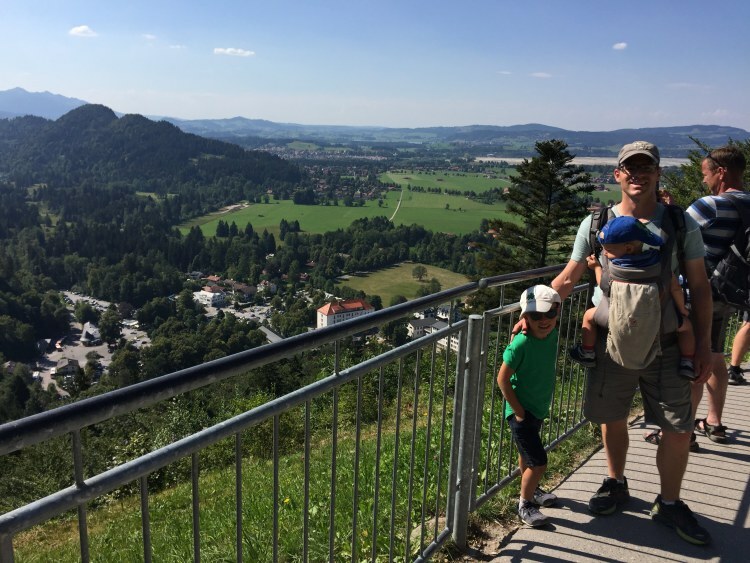 Here is one of the hikes in the area that provides views of the castle, though it does not look child friendly. Popping by was just perfect for us and a great reminder of why we try to travel off season when we can.